Visual Interfaces for Mobiles @ NCSU: Find: Are Tablets Killing E-Readers? Um, No …. Find: Are Tablets Killing E-Readers? Um, No …. But ereaders will shrink in share eventually. E-reader ownership has doubled in less than a year, according to a recent Pew Internet Life study released Monday, while multi-purpose tablets like the iPad which sport apps to read digital books are leveling off. In a poll conducted between April 26-May 22 among 2,277 adults ages 18 and over, 12% of respondents said they owned an e-reader, like the Kindle or nook — twice the percentage in a November 2010 survey, Pew said. 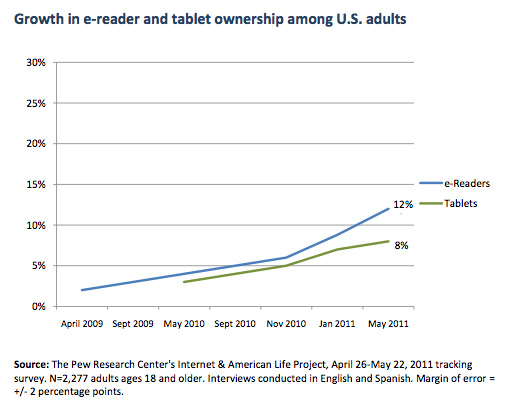 In nearly the same period (from January 2011) tablet ownership edged up by one percentage point, to 8%. Why is an appliance that costs about $140 trumping a mobile internet computer does a thousand more things, albeit it 3-4 times the price? Perhaps because the hardware nearly disappears and the experience of using one more closely resembles the analog reading experience.